Marching Into Our 36th Season! 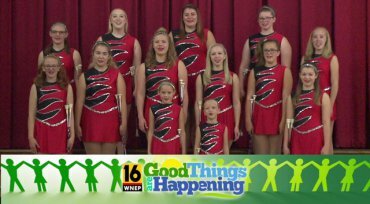 Lynnette's Twirlerettes is Marching into their 36th season and is conveniently located in 3 counties of Pennsylvania: Carbondale in Lackawanna County, Forest City in Susquehanna County, and Lake Ariel in Wayne County. Organized in 1983, Lynnette's Twirlerettes a State, Regional and National Championship Group has traveled and performed extensively coast to coast across the United States, Canada, Bermuda, the Bahamas, Mexico, Central America, the Dominican Repubic and the Netherland Antilles Islands in the Carribean. Travel Performances include the Miss America Parade on the Boardwalk in Atlantic City, the Royal Naval Dockyard-Bermuda, Royal Caribbean's Explorer of the Seas Cruiseship, Cancun- Mexico, Riviera Maya-Mexico, Costa Rica-Central America, Punta Cana-Dominican Republic, Nassau-Bahamas, Caribbean Island of St Marrten, Walt Disney World, Universal Studios, SeaWorld- Florida, the Sugar Bowl and French Quarter -New Orleans, Louisiana, the Liberty Bowl- Memphis Tennessee, the Peach Bowl-Atlanta Georgia, the Holiday Bowl-San Diego California, the Alamo Bowl-San Antonio Texas, Haunted Happenings Parade- Salem Massachusetts, Cape Cod-Massachusetts, National Aquarium-Baltimore, the Rock niand Roll Hall of Fame-Ohio, Virginia Beach, Niagara Falls-Canada, Marineland-Canada, Busch Gardens-Virginia, Ocean City-Maryland, Six Flags Great Adventure-New Jersey, Dutch Wonderland-Lancaster Pennsylvania along with many local sites right here in Northeastern Pennsylvania. Students are taught basic baton twirls, dance twirls, pom pon routines, show teams, marching, parade routines, teams exchanges, and basic gymnastic moves. Special sessions are held for modeling/pageant training, private lessons and tumble- twirl. Private one on one lessons are available for individuals seeking competitive twirling competition or pageant training. Lynnette also works with a number of High School Majorettes pursuing positions at school districts for Feature Twirler and Captain positions. She has also been the choreographer for many High School field shows. Beginners through advanced levels are offered. Baton twirling offers a wealth of self-esteem, confidence, poise, grace, teamwork, and a lifetime of friendships and memories. All students are offered the opportunity to perform in local parades, competitions, summer performances, travel performances and our annual recital. Opportunities are offered to all with no obligations, no registration fee and you can pick and choose what you'd like to participate in. Read more about Lynnette's Twirlerettes here!